« that was easy to draw! Passed a flowering field with Amma having the time of her life as she loves flowers… though I don’t know how she managed not to pluck any over here! Home Sweet Home, East or West, Home is the Best and home lies in the pristine village. Yes, I am allergic when it come to walking barefeet in the city, even just outside the doorstep of my room whereas in any village, I will never feel uneasy since there is no pollution. Of course, the water from the well may not be as clear and ‘impure’ like Bisleri and other branded bottled water but it is ever cool and clean. Well, these thoughts emerged by only glancing at the pics and not any write up. And whatever I have uttered may hurt the urban fundamentalists for which I wish to be excused. 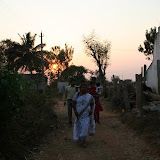 Born and brought up in the city, a village visit is always so refreshing for me. I cant imagine there can be any urban fundamentalists in India because really india is a land of villages. I feel our nation’s progress lies in developing the villages in a decentralized way rather than having everybody cluttered in cities that takes a tremendous toll on the local resources. This is the way I see in a country like Germany – even remote villages have all the facilities that are needed and so people are content to live there and aren’t compelled to concentrate in and overpopulate cities making pollution management such a challenging almost impossible task (and its getting worse day by day). This time I felt I wanted to live there and do some manual work the hard work I saw in a farmers life – atleast for one weekend… I was warmly welcomed by Vijetha’s uncle, so look forward to when I can implement this plan! Well you said it… and rightly too.